Snacks for kids for any time of day: How to deal with a hangry child. "I know exactly what to do when my kids get hangry." There was a time many years before I began to raise small humans, that I believed snacking was a bad thing. Firstly, I apologise to any parent I judged with full side-eye who happened to be giving their hungry toddler a wrapped snack. Now I am a parent of two boys, I feel my shame deeply. Secondly, ‘hangriness’ (the hunger and angry mashup, for anyone who’s been living off-grid for a decade), is real and snacking is sometimes the only answer. Parenting two growing boys, Toby, seven years old, and Leo, almost 18 months, means that they need healthy meals as well as snacks to give them plenty of energy to burn. My two active critters suffer their worst hangry vibes first thing in the morning, after school or sporting activities and late in the afternoon, and if I don’t fill the void in their tummies STAT, things might just get ugly. One memorable hangry attack occurred with our then three-year-old Toby at a sushi cafe, who was not only tired, but jet-lagged. We stupidly decided on California rolls for lunch, even though he wasn’t the world’s biggest sushi fan. Whether it was the jet-lag, his lacklustre feelings for tuna, the disappointment that the sushi train wasn’t Thomas, or a combination of the above, but he quickly fell into a hangry rage. Our lunch date ended swiftly and dramatically as we removed our sad, rigid and screaming child as quickly as possible to calm him down in the park with a banana and a biscuit. • Don’t expect too much of them when they are hungry. After the sushi episode, we decided that trying challenging foods when they were already a little hungry was not a good idea. Thankfully Toby wasn’t scarred by the sushi café hangry attack and he now loves his tuna rolls. In fact, we often default to sushi as a quick and healthy meal or snack to eat on the go as it pleases the whole family. • A simple bowl of cereal at any time of day. A quick bowl of cereal and milk after school and before sport is the perfect snack to make sure Toby has enough energy to get around the tennis court or the soccer field. We have a varied selection in the cupboard that we rotate through daily, but with 4.5 health stars, natural bran fibre and an unquantifiable ‘yummy’ factor, Sultana Bran Buds are a favourite for both Toby and me. Toby gets his fibre in. Image: Supplied. • Snacks that take time to eat and taste good. If I have to bring the boys with me to the supermarket, then I&apos;ll time it so that no-one is starving hungry and an apple or a pear will keep them happy and occupied while we quickly make our way around the aisles. Mini boxes of nuts and raisins are also great for keeping little hands busy and tummies full. • Bite-size pieces of dry cereal are clean and tasty when out and about. Sultana Bran Buds aren&apos;t just great with milk, but they also make a convenient portable snack for times when you can&apos;t deal with banana or avocado mush everywhere. A handful of Buds or a trail mix in a food container when visiting a friend without children and plenty of white furniture, should keep little one entertained while you enjoy a cuppa and a catch-up. • The banana protector case is my best friend. Whoever invented the reusable banana protector case is a genius. A banana is the perfect healthy snack, but chucking it directly into a bag leads to bruising and as any parent will know, a brown or squished banana is not acceptable for anyone, least of all toddlers. I always tote a banana, snug and safe in its protective case, to the local café so that I can enjoy my flat white while Leo munches on his unsullied &apos;nana&apos; for morning tea. • Variety and preparation is key. If we&apos;re at home for morning or afternoon tea then this is the perfect time to offer a range of snacks for kids to try. 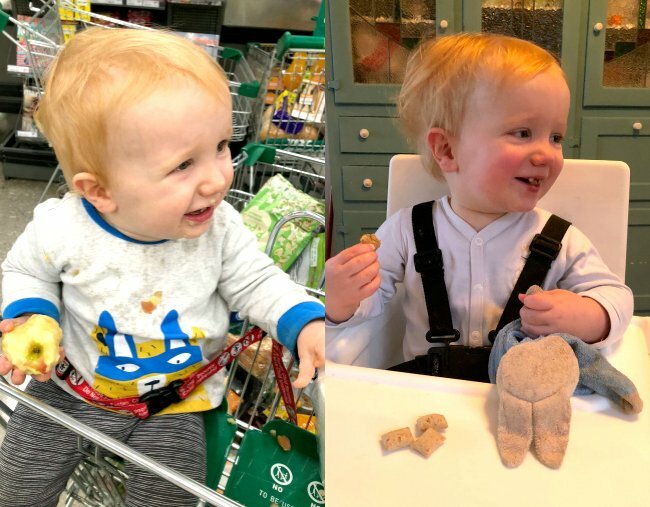 From carrot and cucumber sticks to dried fruit, hummus and pieces or cheese, my boys love a snack plate made up of a variety of colour, texture and flavours to get them through to lunch or dinner. If the cupboard is bare, peanut butter slapped on a cracker is a total snack-win in our house. I don&apos;t always get it right and hangriness sometimes strikes when least expected, but eight years into the whole parenting gig, and I am starting to learn how to spot those hanger vibes and nip them in the bud before we clear the café. How do you deal with hangriness in your children? Any great tips to share? This content was created with thanks to our brand partner Kellogg&apos;s® Sultana Bran Buds®.